Our research has shown that Data, Content and Relevance are some of the biggest challenges facing B2B Marketing Managers. 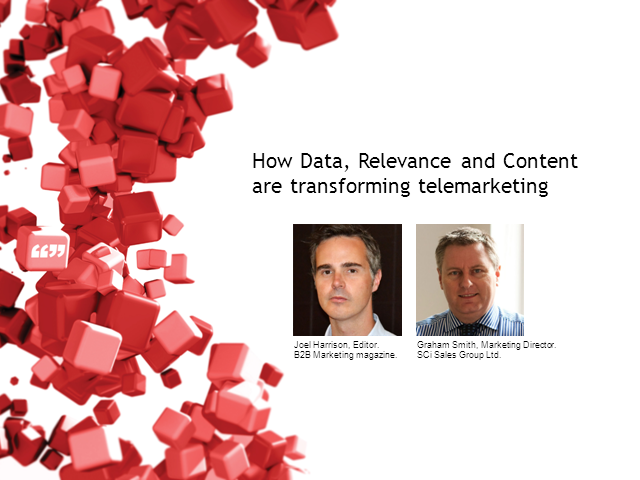 In this webcast we examine how these 3 challenges are changing telemarketing and the opportunities for increased ROI they will bring. The depth of data required to generate content-rich and relevant marketing campaigns has impacted all forms of direct marketing, including telemarketing. We examine how better data reduces the number of excluded calls, helps sales agents to engage quicker and more meaningfully with decision-makers, plus increases synergy with other marketing channels. Content marketing is a phrase normally associated with online channels, but can your content strategy be applied to telemarketing? We will look at how content-driven telemarketing campaigns are building better relationships, especially on extended sales cycles and lead nurture campaigns. Relevance will always give your campaign a higher success rate; relevant message, relevant channel or relevant timing. The immediate feed-back you get through a telephone call can help improve relevance, and greater relevance can mean greater response. We examine the techniques used in ‘relevance based’ telemarketing campaigns. All forms of marketing are evolving and telemarketing is no exception. This webcast discusses issues to help ensure your campaign is ahead of the curve.